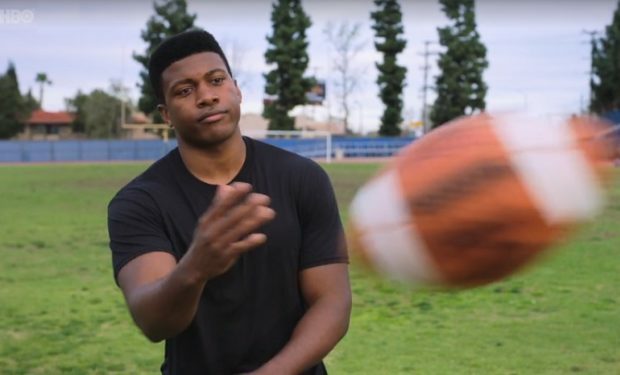 Who Is High School Star Quarterback Quincy Crawford on ‘Ballers’? Who Is High School Quarterback Quincy Crawford on ‘Ballers’? In the Season 4 premiere episode of Ballers, “Rough Ride,” while Joe (Rob Corddry) tries to convince Spencer (Dwayne Johnson) to invest in an extreme-sports LA business run by an annoying Lance Klians (Russell Brand), there are new stars ready to be plucked from high school football fields. One of them is the best high school quarterback in the country, Quincy Crawford. High school quarterback star Quincy is portrayed by Eli Goree. The Canadian-born actor is known for his roles on The 100 (Wells Jaha), Dead of Summer (Joel Goodson), Emily Owens, M.D. (Intern Bomount), and in the film Race about Jesse Owens (high jumper Dave Albritton), and in the 2016 TV movie Toni Braxton: Unbreak My Heart (Babyface collaborator, songwriter/producer Darryl Simmonds), among others. Ballers airs Sundays at 10pm on HBO.